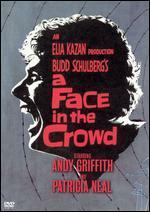 A Face in the Crowd (1957) is a motion picture starring Andy Griffith, Patricia Neal, and Walter Matthau, and directed by Elia Kazan. The screenplay was written by Budd Schulberg, based on his own short story "Your Arkansas Traveler." The story centers on a "country" comedian, a wanderer named Larry "Lonesome" Rhodes (Griffith, in a role starkly different from the amiable "Sheriff Andy Taylor" persona), who is discovered by the producer (Neal) of a small-market radio program in rural northeast Arkansas.